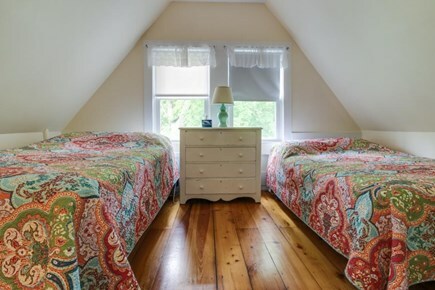 It's all about the stellar location of this five-bedroom Oak Bluffs getaway, a wonderfully renovated Victorian home with a front porch and deck, four bikes to help you explore Martha's Vineyard, and an enclosed yard that is ideal for kids. 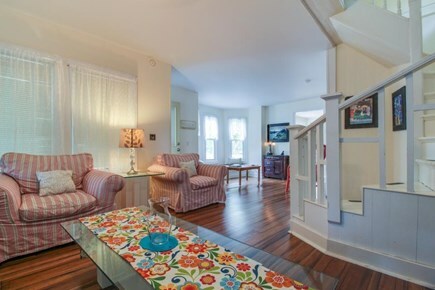 This two-level house sits just half a mile from the Steamship Authority and downtown Oak Bluffs, offering guests unbeatable access to restaurants, beaches, and nightlife. Walk a mere two blocks to reach Oak Bluffs Harbor, or stroll half a mile to visit East Chop and Oak Bluffs town beaches. 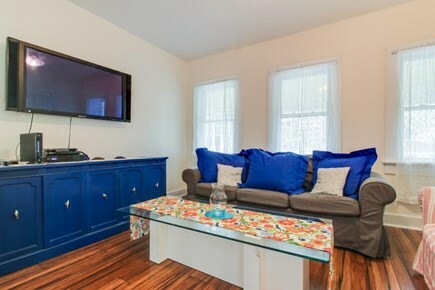 The recently renovated main floor living area is bright and open, featuring a collection of child-friendly games, a lending library, WiFi, and a flatscreen cable TV with a DVD player. 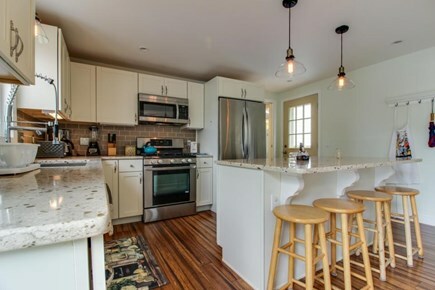 You need only walk a few doors down to sample the island's famous seafood at Ocean View Restaurant and Tavern, but you'll also have a gourmet kitchen with stainless steel appliances (including a dishwasher), a breakfast bar for four, and a dining table with space for eight. 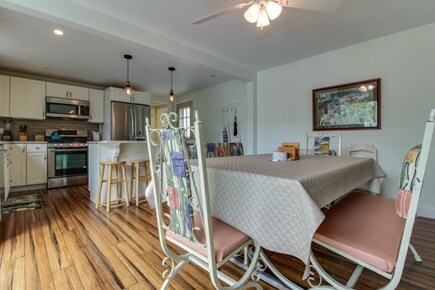 Each morning, gather the provided beach chairs as you head out to East Chop Beach, take a ride through town on one of the four adult-size bicycles, or watch your kids play in the fenced yard. 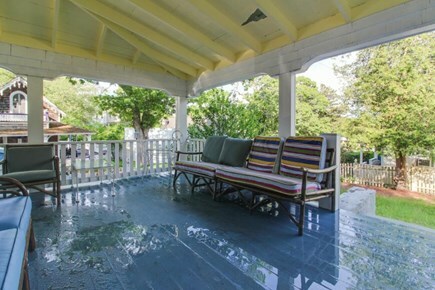 You'll even have a porch, a deck, and electric and charcoal grills to help you enjoy the breezy summer weather. 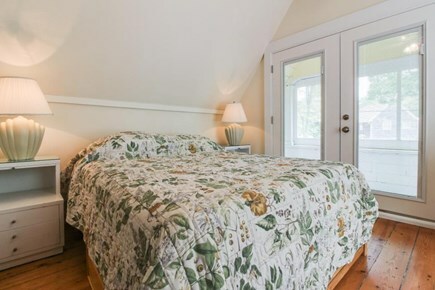 This five-bedroom, two-bathroom home will sleep as many as 12 guests during your Martha's Vineyard getaway. 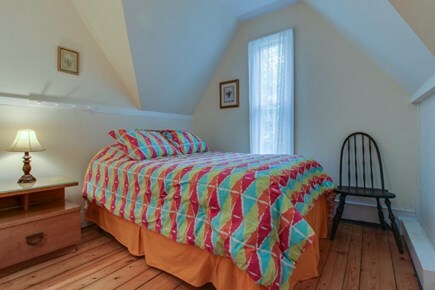 There is one bedroom with a full-size bed on the main floor and four bedrooms with five full-size beds on the second floor. 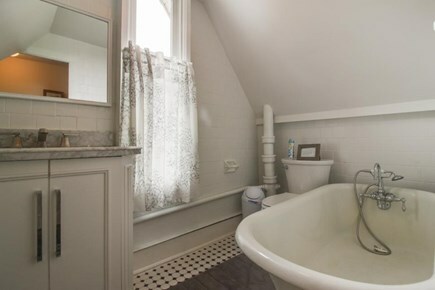 Please note, however, that you must walk through one of the upstairs bedrooms to reach another, creating a fun set-up for children. 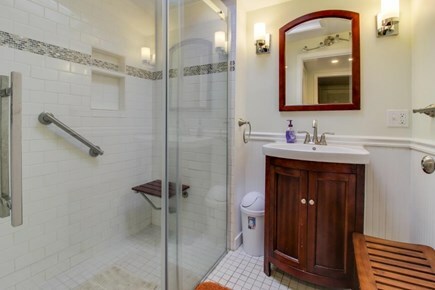 The first floor bathroom has a stall shower, while the upstairs bathroom has a hand-held shower head in a claw foot tub. 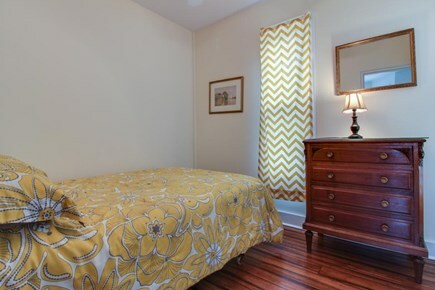 Additional amenities include a private washer/dryer and an enclosed outdoor shower. Whether you're planning your annual vacation or visiting for the first time, Oak Bluffs is one of the most beloved towns on Martha's Vineyard. Take a ride on the historic Flying Horses Carousel, swim near the shore of Oak Bluffs Town Beach, and watch the sunrise each morning from the sand of East Chop Beach. 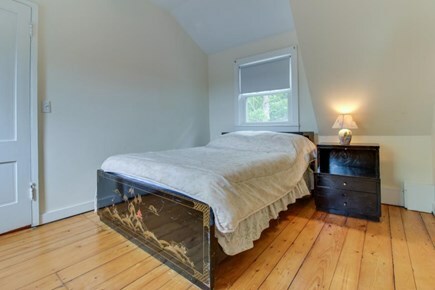 Convenience and Victorian charm come together at this Oak Bluffs home - don't miss out on this one-of-a-kind vacation rental! Book with Vacasa today! 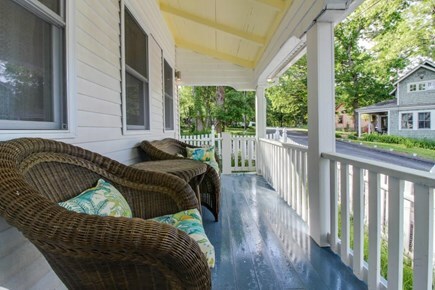 We provide full-service management for privately owned vacation homes, and like to think that we offer our guests the best of both worlds: the unique experience of staying in a one-of-a-kind vacation home, with the peace of mind that comes from knowing that the home you book for your special vacation is cared for by professional housekeepers and local property managers. Inside served our group well. Kitchen was nice. 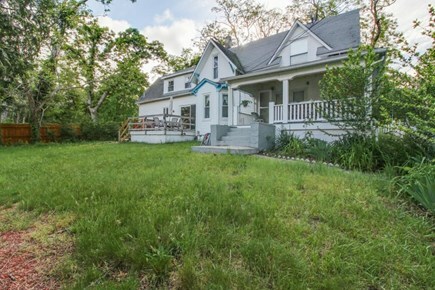 The home served its purpose and we enjoyed our time on the island.